Yes, I’ve been MIA again. Life just seems to get busier every year. I’ll spare you the details for now but I just wanted to share something I thought was so exciting. 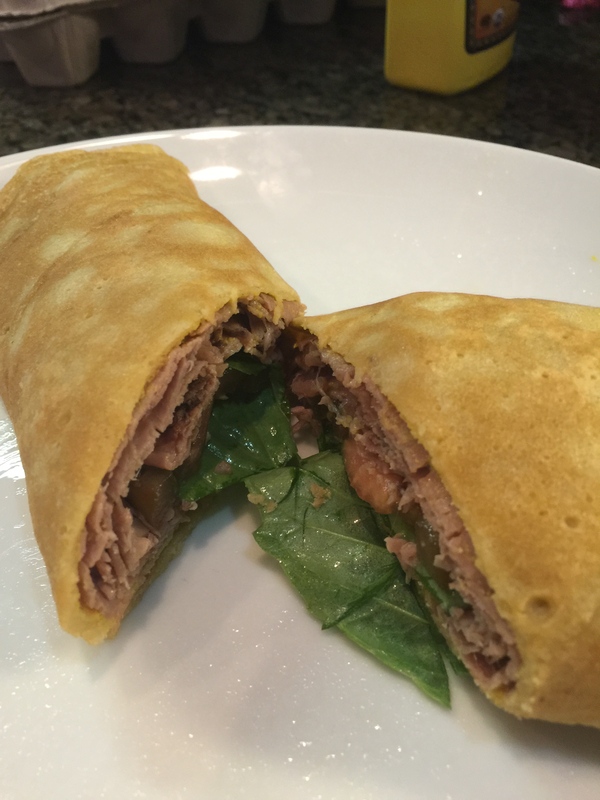 Grain free tortillas! 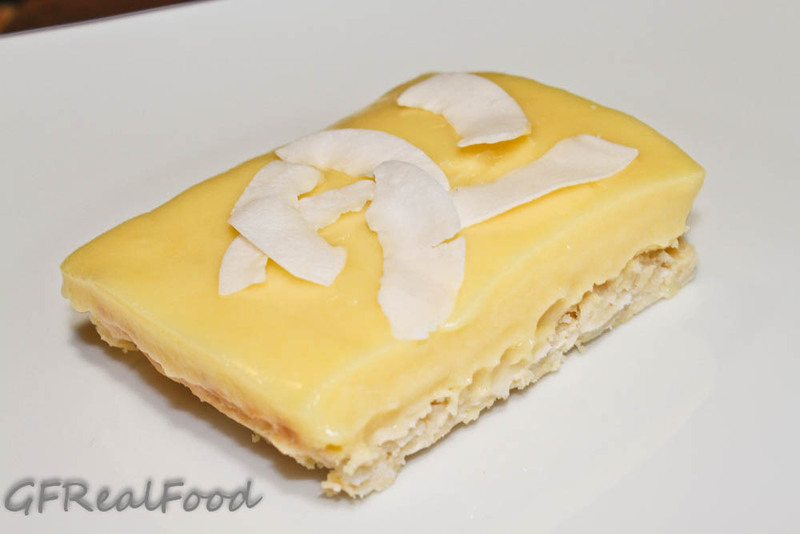 I’ve made versions of this with coconut flour but coconut flour has a very distinctive flavor that I like in baked goods but not much else. These tortillas are soft, elastic and pliable with a neutral flavor. Aren’t tortillas really about what you are eating them with?? These stayed together, didn’t get soggy and weren’t grainy. Can you tell I’ve tried several different versions? I’ve been doing a lot of reading about gut health, our microbiota and increasing dietary fiber. I’m certainly guilty of not having anywhere near enough soluble or insoluble fiber in my diet for years and years on end. And I’ve paid the price. So in my quest to rectify that I’ve been trying out new foods to work with. Plantains were on that list. Plantains have about 57 grams of carbohydrate for a medium green one. Yes, that’s a lot but I’ve never come close to eating a whole one in one sitting anyway. Of those carbs 4 grams are resistant starch. Resistant starch is a type of dietary fiber that we are unable to digest. It travels down to our large intestine where our bacterial army does it’s magic. That starch/fiber is what our gut bacteria feed on. If we don’t feed our micro flora they don’t tend to stick around and proliferate. We can take probiotics but unless we feed them they are transient and temporary. Why is our gut bacteria important? Well, It’s what keeps us healthy. 80% of our immune system is in our guts. It drives our metabolism and those bacteria are the producers of butyrate. Butyrate is a byproduct or waste product of our bacteria feeding on the resistant starch. That butyrate is used by our bodies as energy. It is also a powerful inflammatory in our guts, it helps decrease gut permeability and because that starch isn’t digestible by us but by our bacteria there is no spike in our blood sugar. Actually, resistant starch improves insulin sensitivity and reduces blood sugar. Amazingly, it has a “second meal effect” meaning that it helps control your blood sugar for the following meal as well as the meal in which it was consumed. Resistant starch is associated with a decreased risk of colon cancer and may help with weight loss due to its ability to decrease blood sugar spikes post meal. It may help decrease appetite and help to maintain lean muscle mass. Anyway, back to the recipe. These are the reasons I am excited to find a way to enjoy plantain. Now to the recipe. This was super fast and easy. You will need a high powered blender and a large nonstick pan. Peel and slice the plantain. Add it and the eggs and salt to the blender. Blend until smooth. Add just enough milk to thin out the batter so that you can pour out the batter into a thin layer. Water may work just as well if you are dairy free. Heat pan and enough coconut oil to lightly cover the bottom. 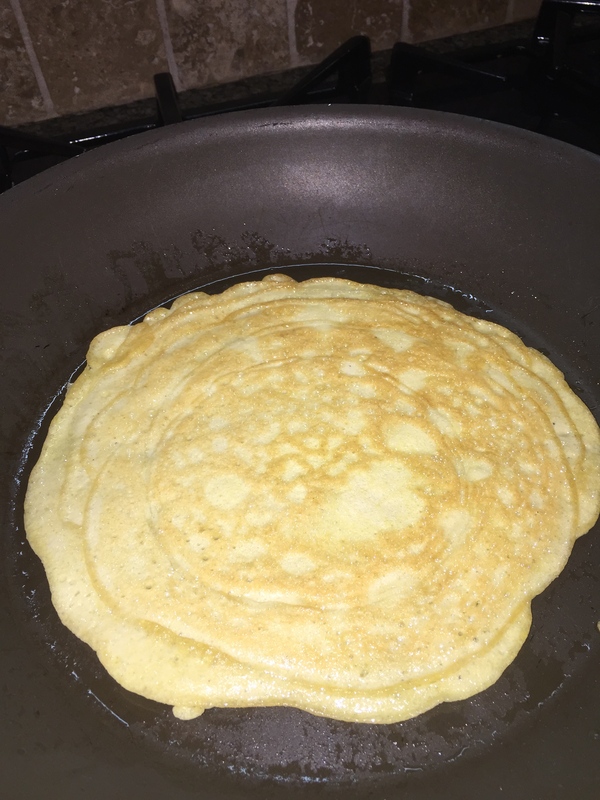 Pour about 1/4 cup of batter into the hot pan and swirl the pan or use the back side of a spoon to spread the batter into and 8-10 inch round. Cook on medium heat until the bottom side is lightly browned and then flip to brown the top side. When finished lay it on a plate covered with a paper towel. Repeat for the rest of the batter stacking them on top of each other with paper towel in between. These were great warm with a little butter (has to be Kerrygold!) or dipped into olive oil. I added some Italian seasoning to one batch and it was great. Next time I will try some herbs de provence. Cumin and coriander might be good too. When they are completely cooled the paper towels can be removed and these can be stored, covered in the fridge. Warm slightly in the microwave for a few seconds to enjoy them later. They are just as soft, elastic and pliable the next day. You simply have to try this. It is a teeny bit time consuming but worth every minute. 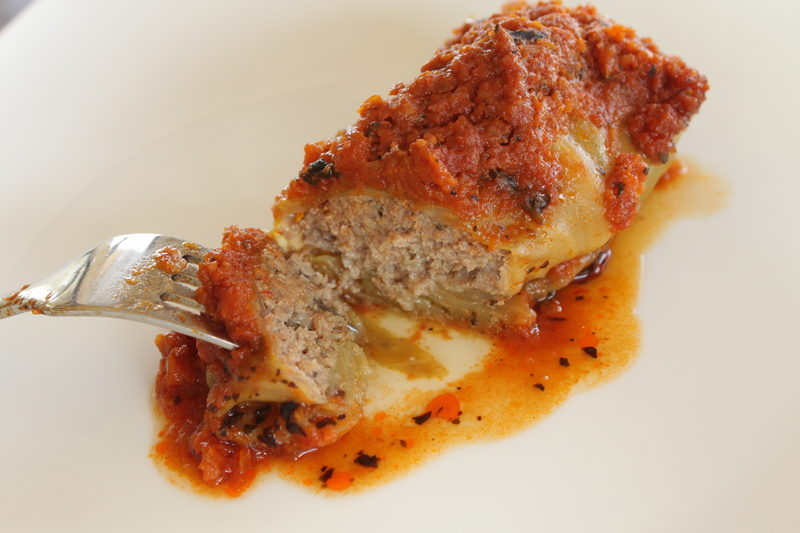 The cabbage rolls I remember – and it’s been a really long time – were stuffed with white rice and ground beef. These cabbage rolls are stuffed with ground beef and cauliflower rice so are therefore low carb, GAPS legal and paleo approved. I did all the work the night before. I made marinara from scratch, as always. I suppose you could buy a jar or two if you are short on time but the sauce is great and has no weird ingredients so I think it is worth the effort. I stuffed the cabbage rolls, put them in my crock pot, covered them and put them in the fridge overnight. In the morning all I did was cover the rolls with the marinara and set the temperature to low. I came home to an unbelievable aroma and a dinner ready to be devoured. Remove core and steam entire, intact head of cabbage in 1-2 inches of water for approximately 5-8 minutes. Set the cabbage in the water core down. There is a fine line between over cooking the leaves and leaving them still too stiff to be pliable. It is probably easiest to steam for 5 minutes, allow to cool enough so that you can peel off the outer leaves and then stem for another couple of minutes to soften the inner leaves. When you have the leaves soft but not too cooked and separated, set them aside. Heat large saute pan and add olive oil. Add onion, celery, garlic and carrots. Instead of hand chopping these I just put them all in the food processor using the S blade and made it into a fine meal consistency. It doesn’t really matter because you are going to blend the final sauce anyway. Saute until veggies are soft, approximately 10 minutes. Add tomato paste, diced tomatoes, salt, pepper, basil, oregano and stock. Simmer, covered for about 30 minutes then remove from heat. Add red wine vinegar/lemon juice. Start mixing the filling for the cabbage rolls now (See next section). When you are done making the filling and the marinara has cooled a bit, use a stick/immersion blender or even food processor to blend your sauce to a smoother marinara. Saute onion and garlic in saute pan with fat. Cook until onions are starting to brown and are soft. In a large bowl combine raw beef, onions and garlic with remaining ingredients. Mix well. Using your hands is easiest. 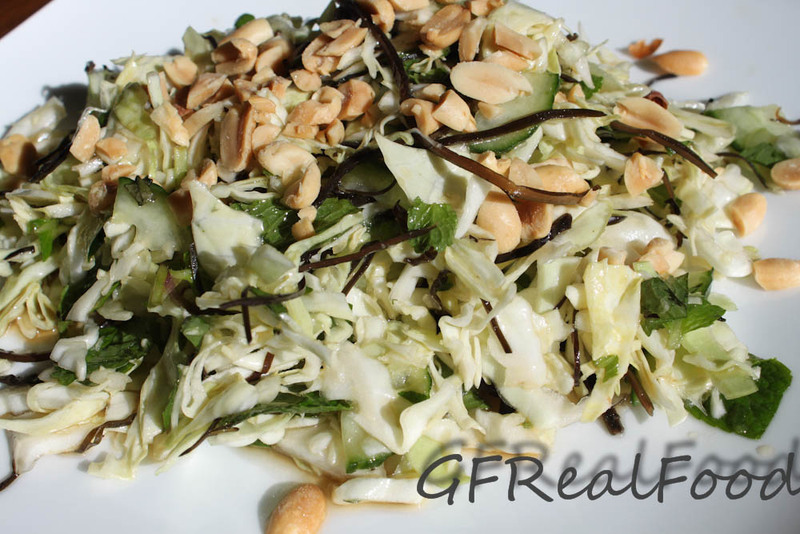 Fill each cabbage leaf with about 1/4 cup of filling. Roll into cylinders and tuck flat edges under. Some of my smaller leaves were still a little stiff (this is why I think the steaming should be done in two steps) so the edges were not tucked. It didn’t matter. I just wedged the looser ones in between the tighter ones. I did all of this the night before and placed them in my crock pot, covered them and put them in the fridge overnight. In the morning, well mid morning, I pulled them out and covered the rolls with all the sauce. I set the crock pot to low and left the house. I came home to dinner ready and an absolutely amazing smell. Honestly, I’m not a big lover of squash. 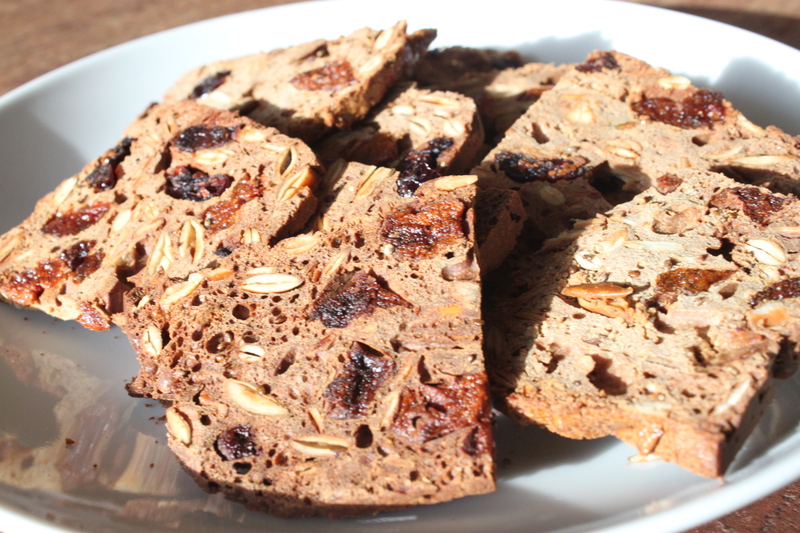 I eat it because it is a sort of neutral filler, it’s often cheap and it’s low carb. I can’t eat it by itself. Ick. In something like my lasagna, sure no problem. So, in my CSA bag for the last few weeks there were several squash. I made some squash pancakes which were great but I still had a few of those squash that have the hard yellow exterior. Those things were staring at me every time I opened the fridge for a week. I considered giving them to the chickens. I am so glad I didn’t. This is by far the very best way I have ever eaten squash. I loved it and so did everyone else. It was great in my lunch the following couple of days too. Drizzle squash with olive oil and season with salt and pepper. Bake at 375 for 20 minutes. Heat oil in large saute pan. Add onions, bell pepper and garlic. Saute for approximately 10 minutes or until veggies are nearly cooked. Add ground beef, Italian seasoning, salt and pepper. When beef is nearly cooked through add tomatoes and olives. Cook until beef is done. Remove from heat and add vinegar. 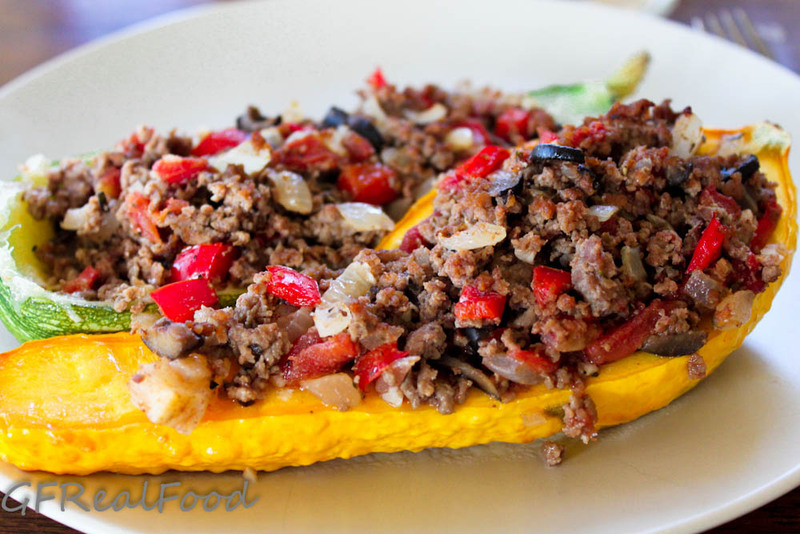 When squash is tender remove from oven and fill tightly with ground beef mixture. Return to oven and bake for 10 additional minutes at 375. Serve immediately.